Matt Wisniewski, a fifth-year computer science major, enjoys creating digital collages for his website, mattw.us. His artwork, including the one pictured above, has been highlighted by art blogs, including LightBox, a <i>Time</i> magazine photo department blog. Answer: I’m from Doylestown, Pa., a suburb of Philadelphia. Q: What brought you to RIT? A: I applied to a number of schools that were known for their computer science program and by the time I had to decide, RIT was the most appealing. Q: What is something that most people wouldn’t know about you when they first meet you? A: Depending on how you meet me, I can come off as shy or serious, but that’s usually because I’m distracted by my own thoughts. I suppose it doesn’t help that my humor is nearly indecipherable. Q: What types of co-ops have you had for computer science? A: My first co-op was for the social networking site QuoJax, located in Rochester. My second was at a company that did a number of things, but their main Web application was PrankDial, a prank calling website. PrankDial was a lot of fun because of the brilliant group of young entrepreneurs I worked with and it was located in New York City. Q: What are you most proud of accomplishing? A: I’ve featured on most of the art blogs that I read and have been contacted by some great photographers. It’s eerie to see people you have a lot of respect for not only knowing your name, but also appreciating something you’ve done. Q: What types of things do you like to do for your website? A: I experiment with all sorts of things, but I suppose the big two are art and Web applications. One of my newer applications allows you to keep track of what TV shows have new episodes airing each week. It’s called, “Is it on?” I like to make useful little things like that. Q: What kind of art do you make? 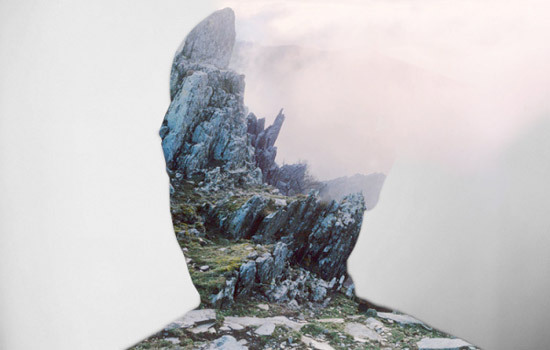 A: I’m best known for a style of digital collage that combines portraits and other imagery. Q: What is the process like when making your digital collages? A: I’ll start by opening a number of images I’d like to use in Photoshop and trying out quick overlays. Once something catches my eye I’ll refine it by hiding sections of the images. The refining bit can take awhile so sometimes I’ll come up with a bunch of ideas at once and finalize them later. A: I don’t know about a specific favorite, but I’m particularly fond of the landscape series. Q: What will you do after graduation? A: Move to New York, get a job in Web development and see what opportunities arise. I’ve been approached about a book of my collages. I don’t think I have the material for that yet, but it’d be nice to see in the future. An exhibition of that work is definitely going to happen at least. Q: Any advice you would give to other RIT students? A: Do what you want and do it often. Scott Bureau covers student affairs for University News. Contact him at sbbcom@rit.edu with “Student Spotlight” suggestions.